I think brussel sprouts get a bad rep. They're actually really tasty, and have become one of my favorite things to eat. When I saw that Cooking Light paired them with pasta, herbs, and some bread crumbs, I practically salivated. I need this cooking in my kitchen ASAP. 1. Cook pasta according to package directions, omitting salt and fat. Drain and transfer to a large bowl; keep warm. 2. Melt butter in a small skillet over medium heat; swirl to coat. Add panko to pan; cook 3 minutes or until browned, stirring frequently. 3. Heat a large nonstick skillet over medium-high heat. Add oil to pan; swirl to coat. Add Brussels sprouts to pan; cook 2 minutes, stirring occasionally. Add onion and garlic; cook 3 minutes or until onion is tender and the Brussels sprouts are lightly browned. Add broth and next 5 ingredients (through pepper). Cover and cook 2 minutes or until Brussels sprouts are crisp-tender. 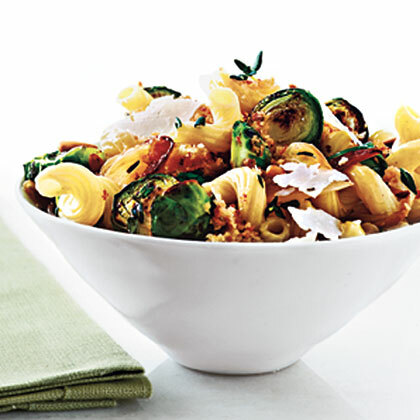 Add Brussels sprouts mixture to pasta; toss well. Sprinkle with cheese, pine nuts, and panko. Serve immediately.